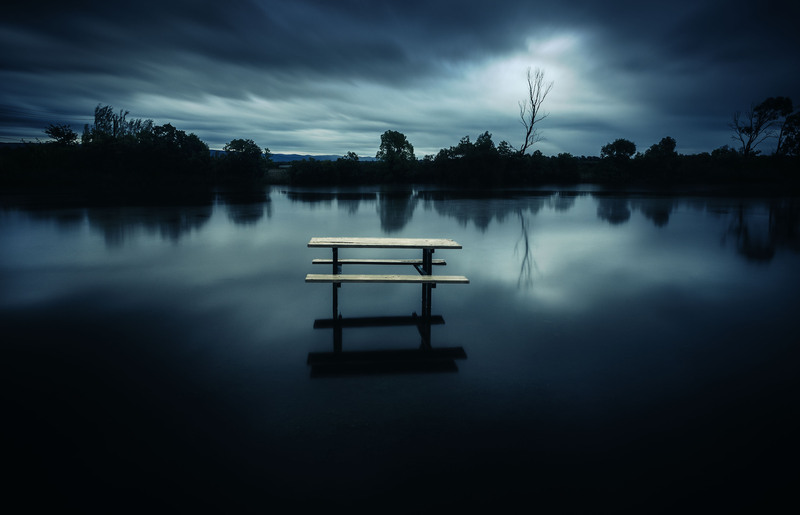 The Smith Park picnic area becomes part of Pugh’s Lagoon on the Hawkesbury River floodplain during flood. IN 1978, my family moved to Richmond. It was the hottest summer and coldest winter for decades. But it was the rain that sent doubts lapping around my parents’ minds about the wisdom of shifting their young children to what was considered a distant outpost. That March, the Hawkesbury River rose to 14.31m above Windsor Bridge. Richmond became an island. Our world ended at Chapel St, Agnes Banks and the RAAF base. Cows and farm equipment were brought up to the high paddocks on the fringes of town. 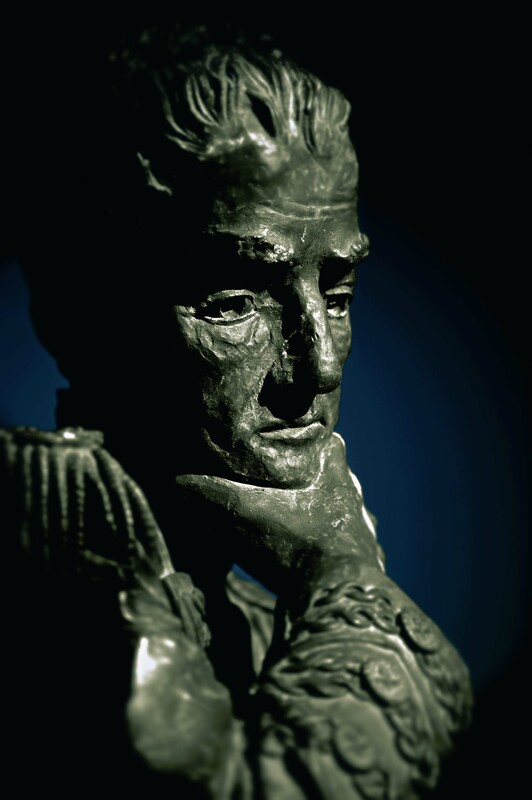 Bust of Governor Lachlan Macquarie. We didn’t know it then, but we and countless others previously and since had one man to thank for our safety – Governor Lachlan Macquarie. Local Councillor and Hawkesbury Flood Risk Management Committee Chairman Kevin Conolly believes the flame-haired leader would be happy with modern efforts to protect residents against flood – Macquarie’s colonial edicts concerning the floodplain continue to influence town planning in the Hawkesbury today. But with many newcomers never having experienced a flood, modern authorities face similar challenges to their colonial peers. Hawkesbury residents have been warned of flood dangers since Captain Arthur Philip saw weeds high in the trees at Agnes Banks. Governor King tried to convince settlers into regions other than the fertile but flood-prone Hawkesbury region. But on his arrival in the fledgling colony in 1810, it was Governor Macquarie who took firm action and ordered the abandonment of floodplain dwellings. Hundreds of terrified souls were plucked from rooftops and rafts of straw but five people died and much of the colony’s food supply was lost. On December 6, 1810, Macquarie gave his famous after-dinner speech proclaiming the five towns of on high ground above the flood plain – Richmond, Windsor, Pitt Town, Castlereagh and Wilberforce. Each settler was allotted a plot in the new towns large enough for a house, offices, garden, corn yard and stockyard relative to the size of their flood prone farm. The swollen Hawkesbury River laps at the deck of Yarramundi Bridge as more heavy rain clouds gather. But settlers largely ignored him at/to their peril. In 1816 the river rose again to 13.88m at Windsor Bridge, then to 14.03m in February 1817. A new benchmark was set for town planners in June 1867 when the Hawkesbury River spilled 19.26m above Windsor Bridge. Fifteen members of the Eather family were swept into the swirling torrent at Cornwallis on the night of June 21. Twelve drowned, including Catharine (just 36), Emma (38), and five children apiece. Ironically, Catharine is buried opposite the start of the new flood evacuation bypass in Windsor. Modern scientific evidence suggests an even greater inundation is possible, one where all that can be done is evacuate as many people as early as possible. Referred to as the probable maximum flood (PMF), experts predict it could reach 26.4m above Windsor Bridge. 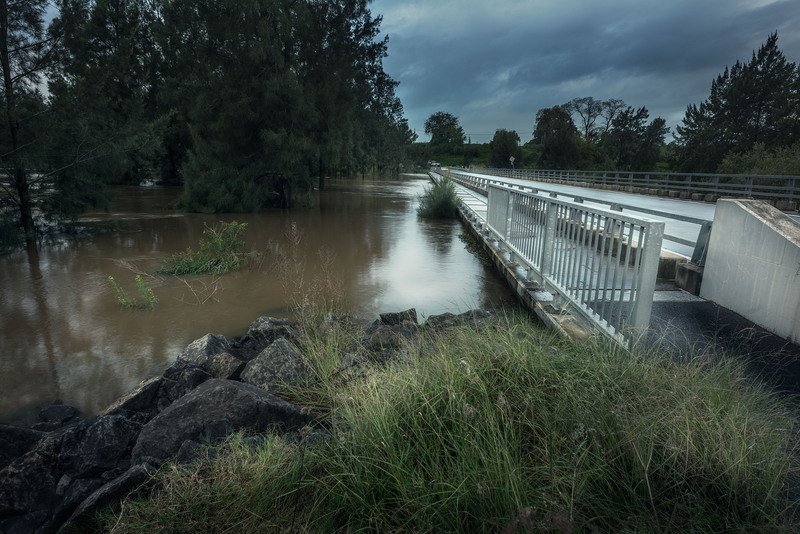 Hawkesbury Council has successfully lobbied governments for flood evacuation routes – Richmond and Londonderry roads have been raised, and a new bypass built between Windsor and McGraths Hill. A higher Windsor Bridge will be built soon, and council continues work with the State Emergency Service (SES) to fine tune evacuation plans and procedures. Lobbyists like Clr Conolly and former farmer John Miller continue to demand that more be done, including raising the Warragamba Dam wall by 4m, which would lower floodwaters by the equivalent of two house storeys, they say. The swollen Hawkesbury River at Yarramundi. John Miller, 81, knows firsthand about floods in the Hawkesbury. Heady with romantic ideals of farm life, he brought his pregnant wife and toddler to his new farm at Sackville in 1955. In 1956, seven floods wiped out every fruit and vegetable crop he planted. After asking neighbours about his property, John relates “he said ‘Well, in 1867 there was a two storey house there and it was washed away, and a bloke found it at the bottom of the Ebenezer gorge’. The zone around John Miller’s former farm is where floodwaters are deepest and most furious. 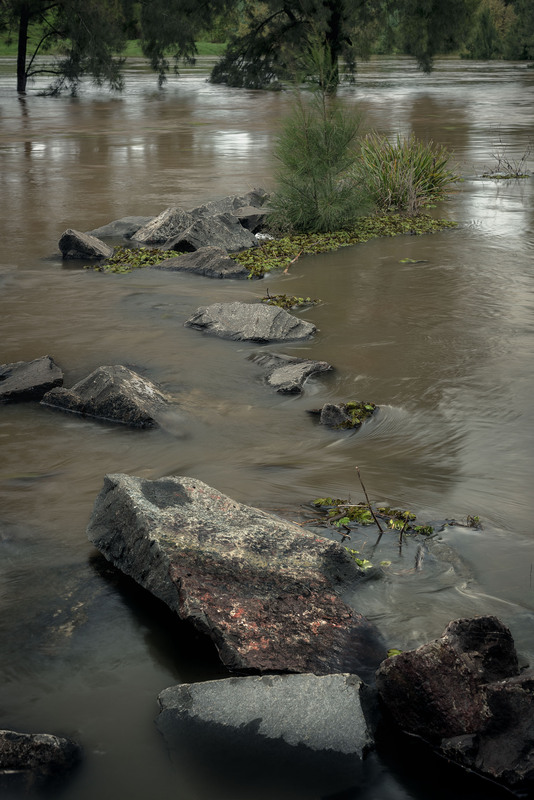 When the Hawkesbury Nepean River floods the water doesn’t just gradually rise – Mother Nature throws a tantrum. 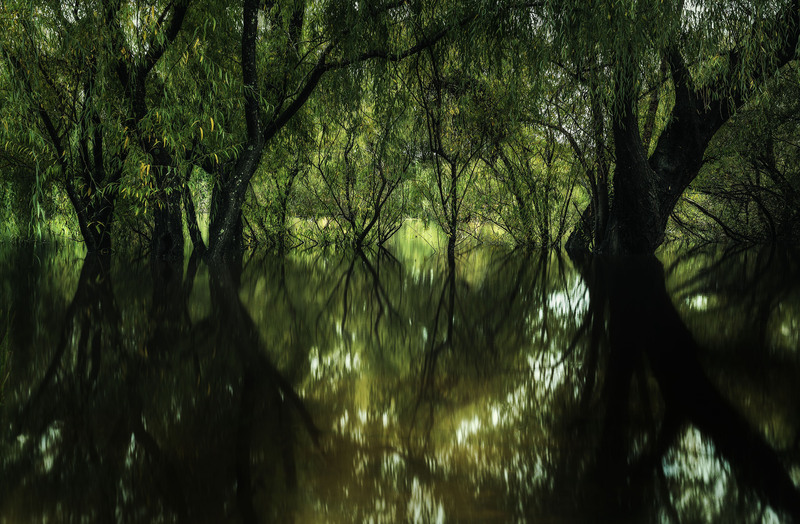 It only takes a few days of very heavy constant rain to cause severe flooding in the Hawkesbury-Nepean Valley because water surges into the valley at a much higher rate than it can flow out. When the water hits the narrow sandstone cliffs at Ebenezer/Sackville, a bottleneck causes the water to back up into the Richmond/Windsor floodplain before heading back down for another go at squeezing through the cliffs. Meanwhile, anything in its path is ripped away and catapulted downstream at great speed. “You’ve got tree trunks” John Miller says. “You’d see them go under the bridge and then spear out of the water as they came out the other side. It was horrifying. Clr Conolly agrees – “The risk is certainly very real. 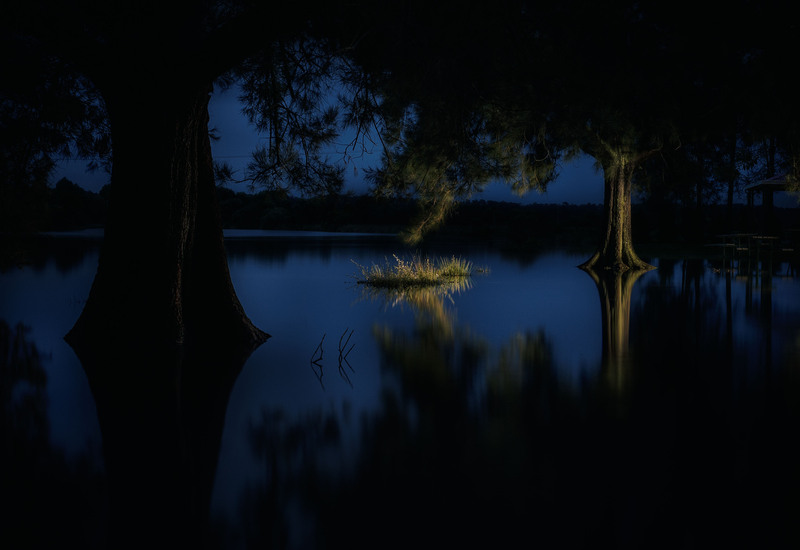 There will be another flood, but there are a lot of people who are not familiar with the fact that it does flood, and the magnitude of floods in the Hawkesbury. 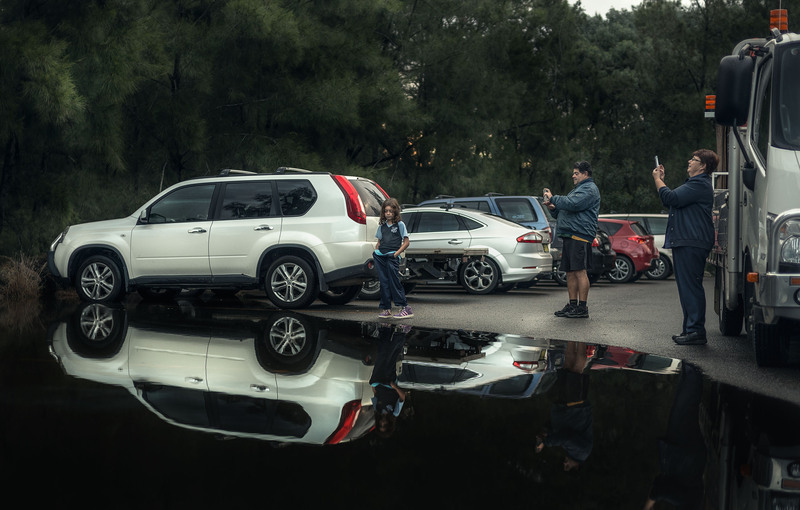 Waters of the Hawkesbury River cover some of the car park at Yarramundi Bridge. • On the right hand side of Cornwallis Rd about 1km from the Greenway Cres and Moses St, Cornwallis, intersection is a simple sign commemorating the tragic demise of 12 members of the Eather family swept into the torrent on the night of June 21. • One of the 12, Catharine, is buried in Windsor Catholic Cemetery, Hawkesbury Valley Way and George St, ironically opposite the start of the new flood evacuation bypass in Windsor. • Away from Windsor, markers can be seen throughout the Hawkesbury to commemorate floodwater height and the location of significant sites including behind St James’ Anglican Church, Pitt Town; and the location of the original church at Sackville Reach near the cemetery on Tizzana Rd. The swollen Pugh’s Lagoon on the Hawkesbury River floodplain at Richmond. This entry was posted on April 23, 2015 by Deep Hill Media. It was filed under Destination, Editorial, History and was tagged with Agnes Banks, Australiana, Blue Mountains Life magazine, Captain Arthur Philip, colonial, Eather family, Ebenezer, farming, flood, flood mitigation, flooding, Governor Lachlan Macquarie, Hawkesbury, Hawkesbury Council, Hawkesbury River, John Miller, Kevin Conolly, McGraths Hill, NSW, Richmond, Sackville, Windsor, Windsor Bridge.